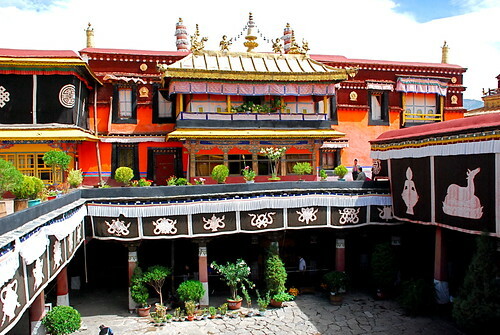 After Potala Palace we toured Jokhang Temple. 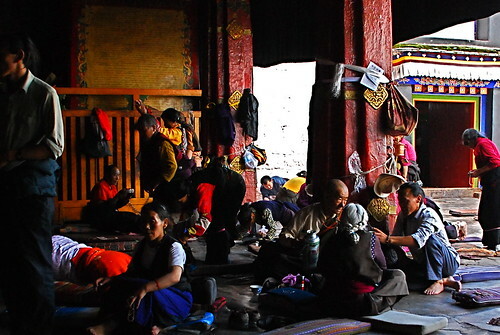 It is considered the most important temple in Tibetan Buddhism, so pilgrims from all over Tibet make the journey to Lhasa at least once in their lives to prostrate themselves here. The pilgrimage itself must be back-breaking work, considering the Tibetan plateau is one of the most remote places in the world and not many can afford to make the trip in a 4-Runner. So many people trek on foot, stopping along the way to meditate and pray. The most devout will travel the last miles on their hands and knees and stomachs, performing prostrations by kneeling with their arms in the air then sliding their hands on the ground in front of them to lie flat. What I would think of as an excruciatingly slow and painful ordeal, these pilgrims probably consider transcendent. I’ve re-posted this picture because 1) I think it’s awesome, and 2) that white building on the left horizon is the temple. Once the pilgrims reach the temple, their journey is not over. They then prostrate themselves along the sacred counter-clockwise route (everything is Buddhism must be performed counter-clockwise) around the temple itself – this is known as circumambulating. 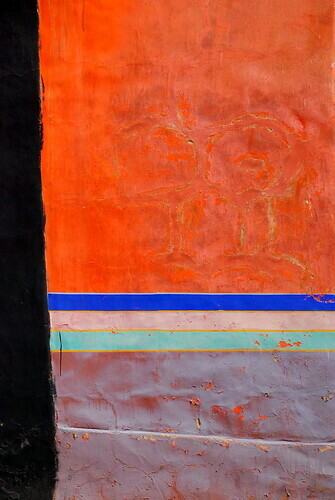 We strolled the route ourselves, observing with ambivalence the juxtaposition of earnest, devout pilgrims and tourists “window” shopping at the many carts positioned there for their convenience. One little boy was prostrating along the route with such vigor and energy that he was practically sprinting and diving onto his stomach, at which point the contents of his tattered backpack would explode out of the ragged holes and scatter at the feet of some sympathetic tourist. I think the kid knew exactly what he was doing. Once they have completed the sacred circumambulation, however, the pilgrimage is still not complete. The truly devout will spend hours every morning prostrating themselves in front of the temple wall in the public square. They have makeshift wooden or cardboard pads to protect their hands from being rubbed raw on the rough ground. 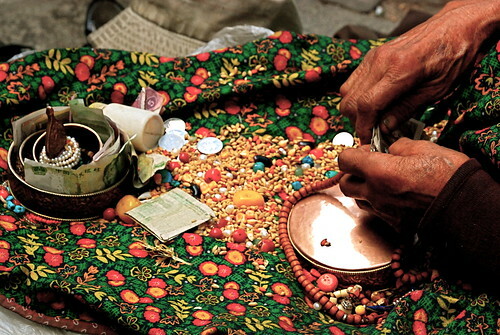 And they use prayer beads to count their prostrations by the hundred. The goal is to perform one hundred thousand prostrations in a lifetime. I’m not sure how many people actually attain that goal. When their ancient bodies can no longer perform the rigorous prostrations, elderly pilgrims will sit in front of the temple with a cloth over their knees and polish a copper pot by methodically rubbing it with beads and grain as an act of austerity. Notice she is still using her prayer beads to keep count of the day’s acts. 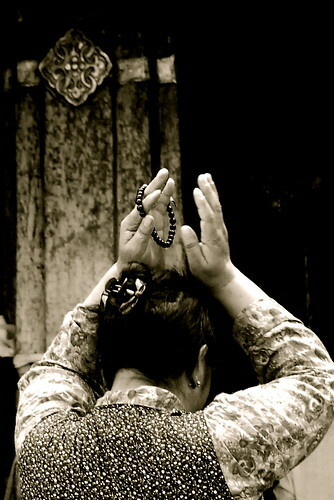 A woman stands to perform another prostration, prayer beads in hand. A monk and a pilgrim performing prostrations, both holding prayer beads. You can see the monk’s red hand pad next to his mat. Buddhists take a rest from their prostrations. 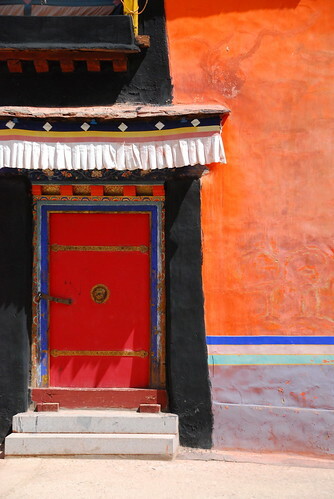 When a pilgrim finally enters the temple, you may notice as you walk counter-clockwise (always counter-clockwise) along the walls of the rooms that he or she is carrying white scarfs, tubs of yak butter, or bread. Buddhists will tie the scarfs onto anything they can reach, and hand the butter and bread over to the monks inside, all as offerings to particular Buddhas or shrines. You will also notice thousands of bills of money in many different currencies folded up and wedged, stuck, poked, and slipped into almost every approachable crack and hole in the building. As a very tall tourist, you might take great pleasure in slipping some bills into a few of the harder to reach places. Another very striking scene is when the pilgrims crawl on hands and knees under the cabinets of prayer books. Temples have thousands of rectangular prayer books filled with Buddhist sutras (like the one below in the picture of the reading monk) stored in cabinets, each of the books lovingly placed in a luxurious red velvet sack. Sometimes the cabinets are built a few feet off the ground so pilgrims can crawl (counter-clockwise, of course) underneath them. Very interesting to see. **A note on proper Buddhist temple etiquette. 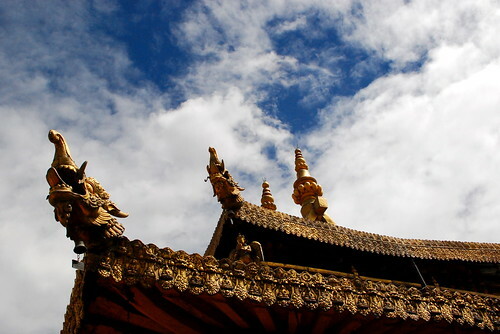 Beside the rule of counter-clockwisedness, there are a couple other guidelines to follow when touring a Buddhist temple or monastery. First, mind the signs about taking pictures. 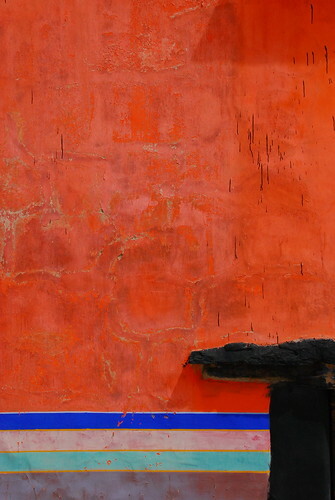 Generally, the further off the beaten tourist path you are in Tibet, the more lenient they will be with photography (there was a monastery near Everest that let us take picture for free! Very different than in Lhasa). Second, never point at the Buddhas. There are so many statues of so many Buddhas in so many shrines in so many rooms that the most logical question when you enter a room is “Now, who is this?” And to distinguish the intended statue from every other statue, the most logical thing to do it point at it. But rather than point, just turn your palm up and extend your fingers Vanna White style. Now you’re a proper temple-goer. 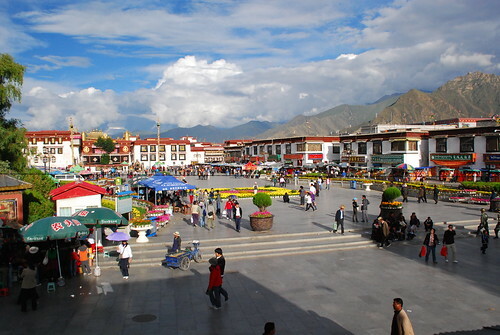 A view of the temple courtyard. 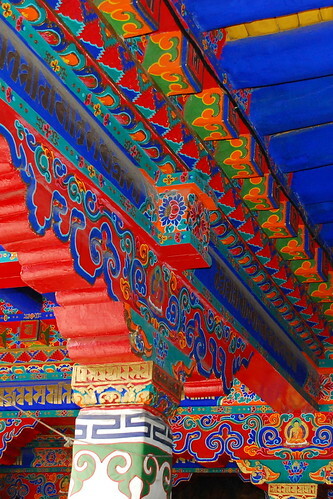 On the ground floor, underneath these balconies, you stand in line to get into the temple. There is a “regulars” line, for people who are actually going to pray, and a “stupid-smelly-ugly-tourists” line, for me and my friends. Tsering took us to the “regulars” line, in the hope that we could just sneak through. If we had known this, we would have told her we’d rather wait with the dumb tourists instead of ruin these Buddhist people’s day. I found out about the line distinctions when a monk sniffed us out (not hard to do – we were the only white people in line) and asked us, I assume with serene politeness, to move to the other line. Unfortunately these lines are controlled by immovable railings set wide enough for only one person, and the monk didn’t want us to jump over. So we had to squeeeeze our big, dumb, stupid, idiot tourist bodies by so many people who just wanted to go pray in their temple. Not a proud moment. 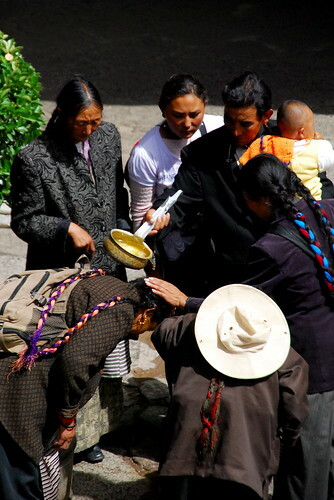 A family pours water on their heads in the temple courtyard. Cleansing ritual? Maybe. Or just cooling off? Doubt it. At this time we were wandering around on our own, so there was no Tsering to answer my question. Not that she would have known, anyway. So you’re waiting in line, you look up, and BAM. The most beautiful and amazing ceiling you’ve ever seen. Tibet never ceases to amaze. So you’re waiting in line, you look down, and BAM. 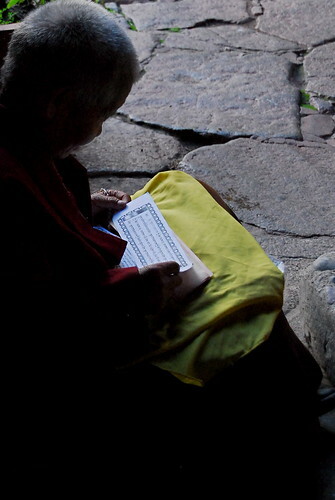 A monk reading his prayer book. 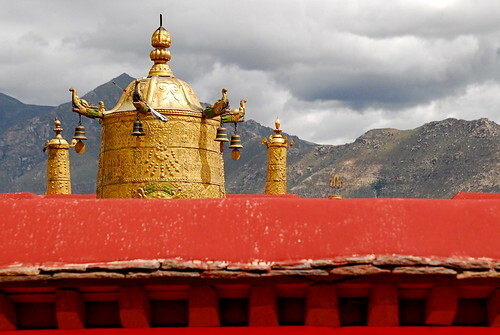 Tibet really does never cease to amaze. Out on the second-story outdoor…er…patio…type area of the temple, shooting up at the eaves. Awesome elephant tower on the roof. I have a thing for shooting doors and windows and walls. If they’re colorful, all the better. If they’re decaying, perfect. 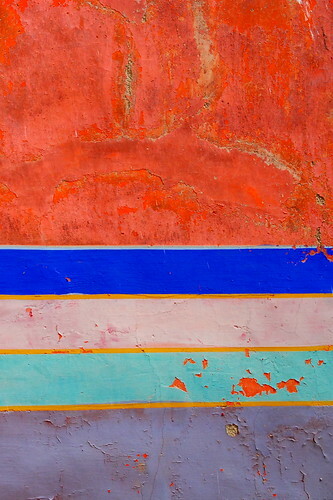 And if they can manage to be both intensely colorful and decayed and cracked and peeling, well, dream come true. One of our travel books described an “authentic yak show” at the Shangri-La Restaurant. So we thought: authentic? Sounds good. Yak show? Sounds awesome. We went there for dinner. It turns out, not so much with the “authentic.” But in the end “yak show” was pretty accurate. It was two people in a yak suit. It came after me, but I stunned it with the flash. So it turned and went after Kristy. Poor Kristy. It was a tragic night, but Sam and I managed to pull ourselves together and get on with the rest of the trip. thanks alinda! it’s definitely a far cry from a rabbit-themed blog, but i’m very glad you’ve been reading! It is a miracle that I survived the yak’s romantic advances. i would have loved to spend some time with the people and learn the proper technique and everything, but i’m afraid it would have just come off as opportunistic and disrespectful. well, more opportunistic and disrespectful than standing on the side and taking pictures of them. Stephen- your pictures are beyond words. I had an emotional response to the black and white one of the woman praying, her hands overhead. I am so glad we all went, and I am so glad you are such an amazing photographer and writer to catch all the emotions- and yak sexual assaults. i’m so glad we all went. i’m so glad i’m doing this project so i can remember all the amazing things we did. i love that pic too. it totally evokes the moment i was feeling while watching her, which is pretty much all i want a picture to do. so i’m thrilled you got the response that i get too. you just made a perfect day in paris even more parfait! well, what better comment could i be looking for?! the yakiness of these pics still tickle me. i think i will put it as my wallpaper. you know? i think “yakiness” is a word that people could make a real effort to use more. lol nice! and i can’t believe you’ve anticipated this, but soon we will be embarking on a journey to everest and on the way we saw a temple that had some wall paintings that could be fairly described as “four-armed man, demon, two monkeys, 1 cup.” complete with…digestive…um…”material”…er…consumption. so have patience, my friend. Merchandise; Purchases; Crap I Bought. This work is licensed under a Creative Commons Attribution-Noncommercial-No Derivative Works 3.0 United States License. Use of any photo for any reason without my permission is prohibited. Danke!